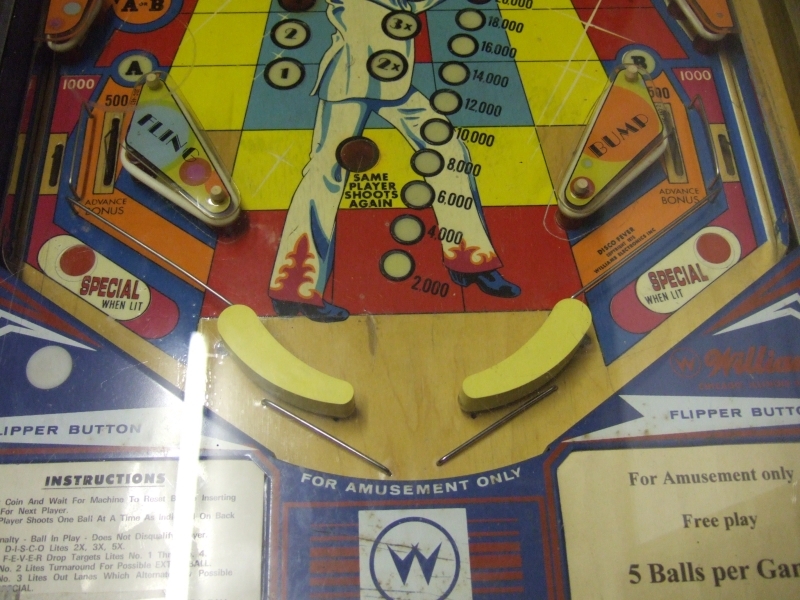 He adds: �Disco Fever was actually the first playable game with curved flippers. Tony (Kraemer) had them made in the model shop out of Nylon, a nearly frictionless material that went "click" whenever the ball hit them, or they struck a ball. (Mike) Stroll played the Disco Fever with curved flippers more than anyone else. I don't remember Roger's (Sharpe) reaction, but Roger can always find something to like in every game. He has his favorites, but he always looks for the most fun feature and plays it as though it might be the last time he ever gets to play pinball. He is usually able to overlook the bad things and enjoy the good things. I don't think Roger ended up liking curved flippers, but you'll have to ask him. The flippers were shaped like a Jai alai cesta, (that's the curved wicker basket that players wear, about 2 feet long and curved with a built-in glove on the end to put your hand into), the ball in the pinball machine did exactly what cestas do--- accelerate the ball at a fierce rate and shoot the ball out on a very straight course into the wall (or targets, on a pinball playfield). "Straight" means that the Jai alai ball (called a pelota) stays about the same height from the ground on its trajectory to the court (cancha) wall 176 feet away. Why? The pelota is slightly smaller than a baseball, very hard, and is caused to spin with great speed and momentum. Gyroscopic forces keep trajectory steady. The ball WHIPS out, and people have been very badly injured, even killed, by the 150 MPH(!!!) ball. 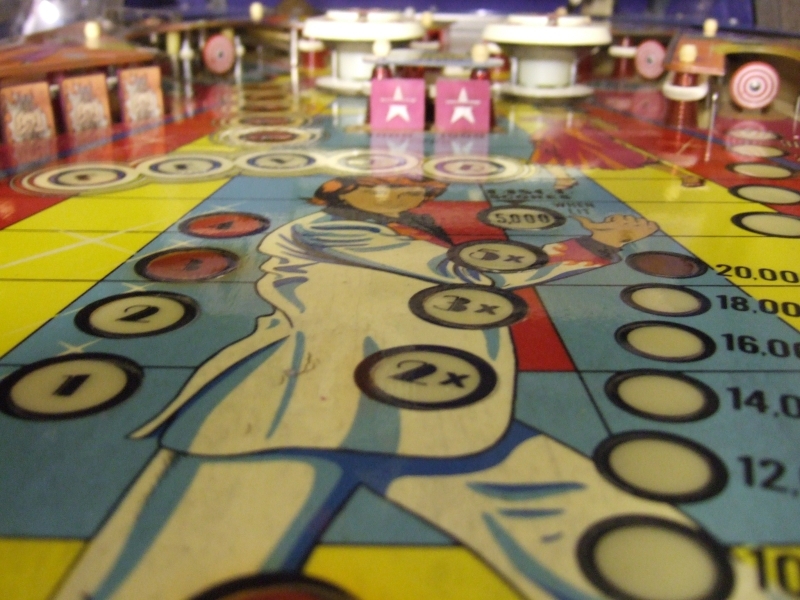 But we're talking pinball here. The engineers made this silly looking thin rubber "glove" to fit over the hard plastic flipper. The gloves fell off often and "clogged the drain" rendering the game unplayable. I think we may have offered glove adhesive to operators, but I'm not sure. Since the curved flippers were fixed horizontally, the physics are applied at 90 degrees to Jai alai, which meant that the targets in the center 6-8" were battered, and it was very difficult to hit outside loop shots, or anything else along the outer perimeter of the playfield. They did nothing to enhance the game, in my opinion. In fact, most of us simply stated "SUX" to ourselves, and waited to see what happened next. Stroll was not easily convinced that they weren't fun. Tony was confused and some Disco Fevers were shipped with them. Then Tony designed Time Warp and a lot of them were shipped with curved flippers. Time Warp (and Disco Fever) made more money with straight flippers than with curved ones, that much I can ascertain through my stack of old Mother's reports compiled by Bill Herman. There are notes that state with/without curved flippers. 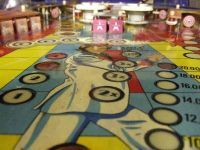 Ritchie also goes on to say: �I adopted a philosophy about flipper placement after first observing pinball play in the early 70's at Atari. Games that had odd flipper placements GENERALLY did not make as much money as games that had more normal arrangements. There are Great Exceptions, including Capt. Fantastic, but even there, the basic 2 lowest flippers are in a very normal position. I would tend to agree with him, even playing emulated or remade tables, I�ve realized that I prefer a more traditional or �standard� flipper layout, so once I get this thing working, I�ll try it with the curved flippers but I think in the long run they�ll be replaced with normal flippers. All I had to do was get it working then. The first job with the my arcade cab project was to strip everything out of it and get it back to a basic shell, then refurbish the shell first before fixing the inner workings, but on this project I opted for doing things the other way around. This was only one game compared to the MAME Cabs thousands of games, so if I didn�t particularly like it, it wouldn�t be a keeper. I would sell or trade it, but that is much easier to do and it makes it much more valuable if it is working. Refinishing the artwork and painting the cab might make it look a whole lot better but wouldn�t make it much more valuable or useful to me if it wasn�t working, so exactly what state was the machine in? Well, it had all its legs though they were a little rusty and held on with an incomplete set of leg bolts. The paint work in general is OK but a little faded and in places has scratches through it and the corners have chips missing in places. The backglass is showing signs of heat damage with cracking paint over most of the glass which is a real problem to fix, and certainly not as easy to repair as the cab paintwork. 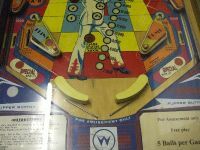 Usually the signs of wear and tear on a pinball machine are on the playfield where the ball constantly runs over it, particularly around the flippers and around pop bumpers where the ball is under quick changes of direction and travels often. 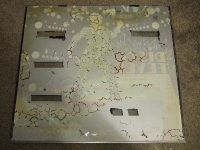 My playfield has a mylar coating over it which protects the paintwork of the playfield but if this is retro fitted it is sometimes fitted over the top of a worn playfield. What also happens sometimes is that the parts of the playfield where there are lights, there is as round hole drilled out of the wood and this is then filled with a plastic fitting that has the bulb inside it, but sometimes these plastic fittings can slip downwards slightly and that leaves a small recess in the playfield so they need tapping back upwards from underneath the playfield so it remains as flat as possible. Then of course are all the actual targets and toys on the playfield that need to be in working order so you can play the game properly. As I said earlier though, the main thing for me with this machine is that it works, so I will get onto the cosmetics when, and only when, I can play the damn thing. 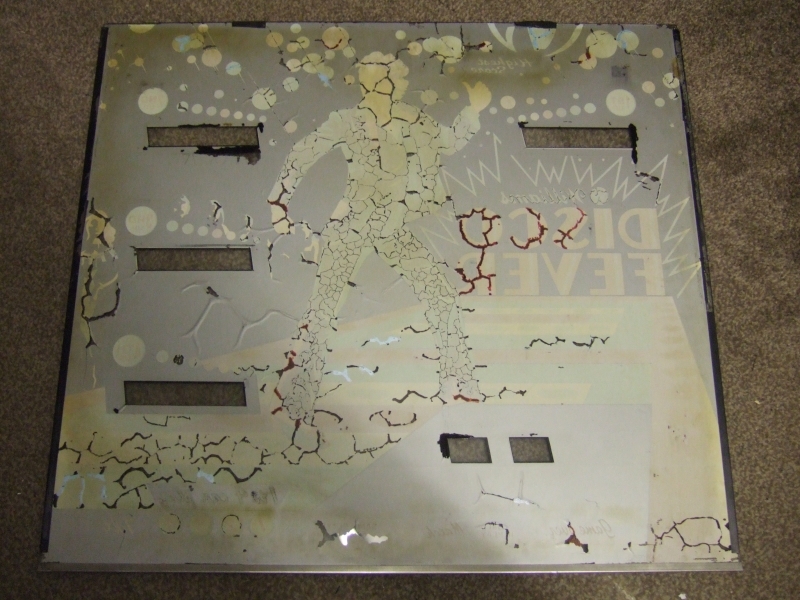 I want to play my pinball, and until then the paint can wait.